Kawangware Kings are the newest rappers or rather trappers out to make a point in the Kenyan hip-hop scene. The rap group that comprises Obiero Clinton aka Lyn Clint King and Kennedy Kwendo aka Kena Kraizy Youngking prides itself in making feel-good music. Lyn: After completing my secondary education at Kaimosi Boys School in 2013, my friends, from our neighbourhood in Kawangware, and I started rapping. Then we started recording our songs at a studio there. We later got signed but I quit because the music was not heading anywhere. One day, however, I came across auditions in another part of Kawangware, for Nairobi Artistic Youth Association in 2015. They were looking for musicians, models, dancers and actors. I passed the auditions and joined the group as a music director. The group was later disbanded because people got jobs and other things to do, and couldn’t commit to it. I continued on as a solo rapper. Kena: I cleared high school at Jamhuri in 2014, and that’s when I got serious with Nairobi Artistic Youth Association. I joined the group as an actor, and doubled as a beauty therapist. However, I felt that I would be able to express myself better as a rapper, because you get to say what you feel, and I approached Lyn for a collaborative project. I used to look up to him. He told me that I would have to pay him and also pay for studio time. When I was ready with the payment, I went to him and he gave me beats to write bars to. He sent me back more than a few times because my lines were not up to scratch. Until finally, based on the advice he had been giving, I came with bars that totally lit up. What makes you guys stand out? Kena: I rap in Swahili and he raps in English. Lyn: We are just trying to ensure people from all social standards can listen to our music. How many tracks have you done as a group? Lyn: We started officially in 2016, and dropped three tracks and videos that year. However, we’ve come up against some issues that only made us release one video after that. But we are back now and released a new video last month. What type of music do you do and where do you record them? We do feel-good music; we’re in a generation where people want to turn up and feel hyped. The youth nowadays don’t want to hear about the problems they face in their music. They want to get away from that depressing reality. This type of music actually motivates them. AJ On The Track produces our beats but we do the recording at Motif On The Beat, who also produces for Khaligraph Jones. Our videos are shot by Cash Kid who is now working with Compact Records. We remained close friends with the manager of the disbanded Nairobi Artistic Youth Association, and he is the one who manages us now. 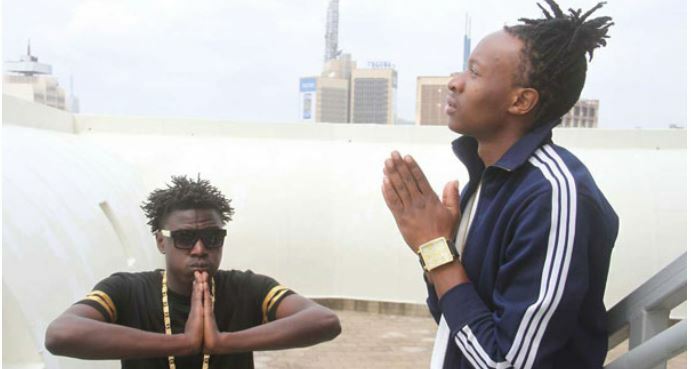 What do you think of the Kenyan music industry so far? It’s really hard. There are cartels out here who you have to go through in order to get your music out. People want to get paid even to play good music. We thank the few who have taken Kawangware Kings’ music on after listening to it. It also boils down to the hard work you put in. We appreciate that there are one-hit wonders out there and stakeholders want to see consistency first. We get called back by presenters who listen to our music for the first time to do interviews because they appreciate the work we have put in. Which comes first for you, the beat or the lyrics? The producer comes up with the beat and then we, as the artistes, come up with a title. After that, we sit with our manager and decide what direction we would follow with the track. We write the lyrics based on how we feel about the beat. Do you see competition in the rap game? Kena: There are dope rap emcees out there. But we’re also dope emcees ourselves. The competition that we have or see is a healthy one. We like that because if someone comes out with a quality track or video, we will appreciate that because we expect them to reciprocate that when we do the same. In the next three years, Kenyan rappers will be so much higher up in the food chain internationally. Have you ever had beef? Kena: There’s a guy who felt that the hairstyle I had in a certain video was his. I was wondering how that could be yet it wasn’t registered to him. We squashed that misunderstanding and we’re now friends, though. Lyn: People are obviously going to talk when you’re successful. What is in your immediate future? We are working on the album which is going to be called “King’s Way”. Check out one of their videos below.